This article is about the minigame from Mario Party 7. For the minigame of the same name from Mario Party 5, see Shock Absorbers (Mario Party 5). 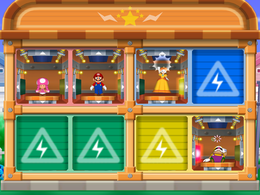 Shock Absorbers is an 8-player minigame in Mario Party 7. Its name is a pun on electric shocks and shock absorbers, mechanical devices meant to soften jolts sustained by moving vehicles. In this game, each of the eight players is secluded inside a box with three switches, and the players have to hit the switch that lights up. When all three switches are blinking red, players must duck to avoid the jolt. If the player hits an incorrect switch, or is zapped by all three switches, the he/she is eliminated after being electrocuted. The last player standing wins for his or her team, even if that player's teammate was eliminated. If remaining players from different teams get electrocuted at the same time, the minigame ends in a tie. Rules – "Punch left, right, and up to hit the lights when they blow. If every light is glowing, duck!" Advice – "You'll lose if you fail to punch a glowing button, or if you press the wrong one." This page was last edited on May 23, 2017, at 01:21.